The Colonial hotel was built on the location where the old Santa Maria de Gracia Convent was found in 1588. Its décor includes art by notable Mexican painter, Raúl Anguiano, and hand-painted furniture by Alejandro Rangel Hidalgo. Hotel de Mendoza magnificently reflects the historical spirit of Guadalajara, and at the same time, is a marvelous modernity of a new generation. 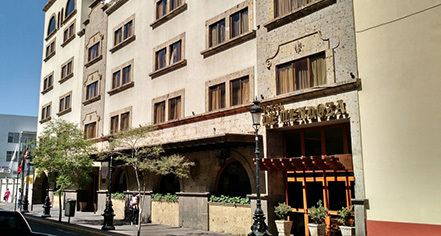 Located in the heart of the historic downtown area, Hotel de Mendoza is steps from the Degollado Theater, home to the Jalisco Philharmonic. 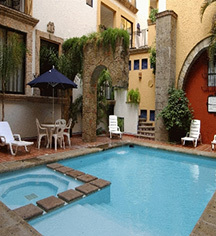 Notable attractions close to the hotel include Templo de San Agustin, Guadalajara Cathedral, Plaza de Armas, University of Guadalajara Assembly Hall, and Cabañas Cultural Institute, a UNESCO World Heritage Site. Hotel de Mendoza, a member of Historic Hotels Worlwide since 2016, dates back to 1588. The front wall of Hotel de Mendoza, and the adjoining wall to the Santa Maria de Gracia Church, were part of the original convent. Visitors to Guadalajara will appreciate the Hotel de Mendoza’s comfortable and cozy guestrooms, along with its ample amenities for an enchanting Mexican getaway. Learn more about the History of Hotel de Mendoza .